Many Christians struggle with the issue of tithing. 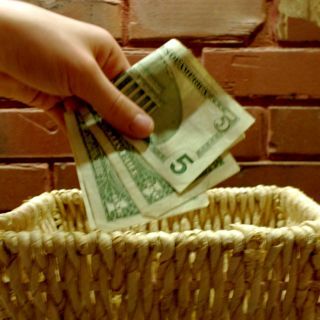 In some churches tithing is over-emphasized. At the same time, many Christians refuse to submit to the biblical exhortations about making offerings to the Lord. Tithing/giving is intended to be a joy and a blessing. Sadly, that is sometimes not the case in the church today. The tithe was a requirement of the law in which all Israelites were to give 10 percent of everything they earned and grew to the Tabernacle/Temple (Leviticus 27:30; Numbers 18:26; Deuteronomy 14:24; 2 Chronicles 31:5). In fact, the Old Testament Law required multiple tithes which would have pushed the total to around 23.3 percent, not the 10 percent which is generally considered the tithe amount today. Some understand the Old Testament tithe as a method of taxation to provide for the needs of the priests and Levites in the sacrificial system. The New Testament no where commands, or even recommends, that Christians submit to a legalistic tithe system. Paul states that believers should set aside a portion of their income in order to support the church (1 Corinthians 16:1-2). So why do we tithe? The Bible says, The purpose of tithing is to teach you always to put God first in your lives. (Deuteronomy 14:23 TLB) Tithing is a reminder that God is the supplier of everything we have. It is also God’s personal invitation to an outpouring of his blessing in your life.